To get there, simply sign in, click on the my paintworks link up at the top of the site, and then click the my Traffic tab. Usually traffic statistics are presented as clicks per day. In DPW, your traffic is presented by artwork and not by the day the clicks occurred. This can be confusing because there are dates on the horizontal axis, however these are simply the dates your paintings were published and not when the clicks occurred. So, if you published a painting on July 3rd, then all of the clicks on that painting would be charted on July 3rd regardless of when the clicks occurred. While this approach doesn't show your overall trend in traffic over time, it does show you the relative popularity of your paintings. What do the Categories of Clicks Mean? There are four categories of traffic that are presented in the chart. You can switch between viewing them by using the View Stats drop down list above the chart to the left. 1. 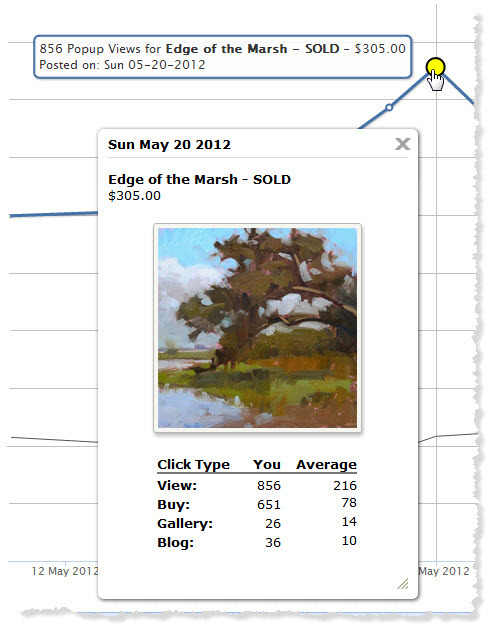 Popup View - the number of times a thumbnail of your painting has been clicked on any page in DPW or in the Daily Email. 2. Gallery Clicks - the number of times the link to your DPW Gallery is clicked in the popup window for a painting. 3. Blog/Website Clicks - the number of times the link to your blog or website, if you have one, is clicked in the popup window for a painting. 4. Facebook Clicks - the number of times the link to your Facebook page, if you have one, is clicked in the popup window for a painting. You can set your blog, website, and Facebook page URLs on your Account Info page. The statistics chart is quite interactive toward the goal of letting you clearly see which paintings are receiving traffic. Up above the chart is a date range drop down list and to and from date fields. Use these to constrain the paintings being charted by time. Keep in mind if you select a date range that is wholly in the past you will no longer see any new paintings in the chart. To see these again, simply select an open ended date range such as Current Year, Current Month, Last 30 days, or a Custom Range with no to date. You can mouse over a painting in the list to the left of the chart to view summary information about it in a tool-tip or click a painting to open a popup with a thumbnail and a table of the painting's statistics. You can do the same with the bars, which correspond to a painting. Posted - Fri, Jun 8, 2012 at 2:59 PM. This article has been viewed 13679 times.